This weekend, The Who’s splendid 50th anniversary tour reaches the climax of its UK leg, with celebratory shows at both London’s Hyde Park and Glastonbury. 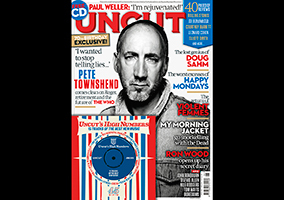 To coincide with these momentous events in the Mod calendar, I thought I’d post my Pete Townshend cover story from the June 2015 issue of Uncut. It was the fruits of a digressive, two-hour interview – which took place in a hotel over the road from his home in Richmond – where Townshend spoke candidly about his complex relationship with both The Who and his bandmate, Roger Daltrey. But for all Townshend’s attempts to codify and finesse his past, there are other, present-day concerns that require his attention. In the middle of all these reissues, box sets, anniversary gigs and classical engagements, Townshend turns 70 on May 19. “It is,” he says with commendable understatement, “an interesting year.” He has no particular plans himself to mark this auspicious date – “Other people are, but I’m not.” In fact, he’ll be on tour in America, somewhere between Philadelphia’s Wells Fargo Center (May 17) and the Nassau Coliseum (May 20), on the first leg of what he confirms is The Who’s final large-scale arena tour. “Touring is an ordeal,” he says. The question ‘What next for The Who?’ looms large during our two-hour interview. Will there be more new music? Will they ever play live again after this year? And what is the current state of his relationship with Roger Daltrey? As he reaches such a landmark age, will Townshend retire? Townshend helps himself to another cup of tea (PG Tips, skimmed milk, one sweetener), and prepares to answer all these questions – via a number of often fascinating, sometimes infuriating digressions that take in EastEnders plot points, his Sixties peers, “dying” in Steve Strange’s Blitz club and the Charlie Hebdo killings as well sharing fond memories of his fallen comrades, Keith Moon and John Entwistle. “You just never really know what’s going to happen, but it’s always very satisfactory. Grim, but satisfactory.” He is taking about EastEnders; but it seems a particularly apt description of another, esteemed and long-standing soap (rock) opera: The Who.